Photo credit: Photographer: Andrew Harrer/Bloomberg. Now, as the scheduled 2018 implementation of the tax gets closer and more and more colleges begin to adjust their health plans to deal with it, awareness of the impending pain is beginning to spread. In New Jersey, four of the state’s 11 public colleges and universities have dropped student health insurance, and three of Washington State’s 6 public institutions have done so as well. Starting in 2018, the tax will be applied to the value of health plans above the threshold of $10,200 for individuals and $27,500 for families. These thresholds will grow at the rate of inflation instead of the faster historic growth trend of health costs. As a result, the tax, sold as only targeting people who have high-value plans, will hit all sorts of people. To give us a sense of how expansive the 40% excise tax’s reach will be, here’s a chart by Conor Ryan at the American Action Forum. 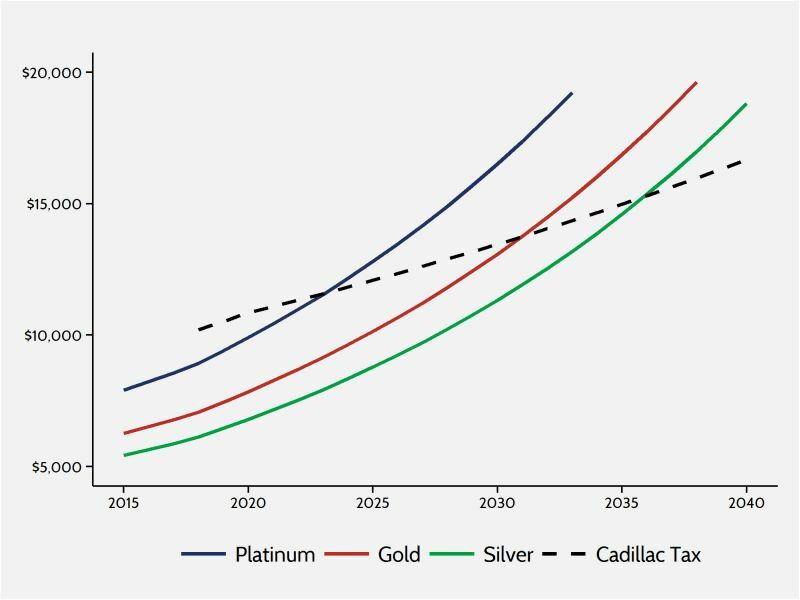 Using HealthCare.gov’s metal levels that describe health plan coverage levels, it shows that the excise tax will not only affect high-value platinum plans but lesser-value gold and silver plans as well. Individual market premiums projected relative to the 'Cadillac Tax' threshold over the next 35 years. Source: American Action Forum. This is analogous to “bracket creep” Americans faced in the 1970s, when they were pushed into higher tax brackets because of inflation. While individual market plans are not actually affected by the tax, the metal level designations provide a benchmark for the employer sponsored benefits that will be taxed. The design of the tax is an Obamacare feature not a bug. As I noted in a previous post, MIT economist Jonathan Gruber, who worked closely with the White House on health care law, admitted the tax is intended to eventually affect every health plan. In a 2012 speech at the University of Rhode Island, he said, "Over time [the excise tax] is gonna apply to more and more health-insurance plans." For employers already working to comply with a myriad of new taxes, penalties, and mandates, the cost of the 40 percent excise tax will leave many businesses with few options. Accordingly, the cumulative effect of these new taxes and fees is hindered economic growth and job creation. An economic rule of thumb is "When you tax something, you get less of it." Unless the tax is repealed, Americans across the board will lose access to the health coverage – the opposite of what Obamacare promised.